While Saint Patrick's Day parades have been held in Boston since 1876, Evacuation Day was not declared a holiday in the city until 1901, amid interest in local history that also resulted in the construction of the Dorchester Heights Monument. The state made it a holiday in Suffolk County in 1938. The large Irish American population of Boston at that time played a role in the establishment of the holiday. A 1941 law establishing the holiday in Suffolk County was signed in both black and green ink. Evacuation Day activities in the areas that observe the holiday are limited. Most events of note, like the annual parade and politicians' breakfast in South Boston, are dominated by celebrations of Irish culture. The parade is officially designated the Saint Patrick's Day and Evacuation Day Parade. The Allied War Veterans of South Boston mark the day with a ceremony on Dorchester Heights. Since 1992, the participation of gay and lesbian people in the parade has been disputed, and was the subject of the 1995 U.S. Supreme Court case Hurley v. Irish-American Gay, Lesbian, and Bisexual Group of Boston. Mayor Thomas Menino boycotted the parade every year he was in office, in protest of the exclusion of LGBTQ+ marchers. Another local holiday observing an event in the American Revolutionary War is Bunker Hill Day. 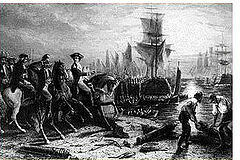 State workers outside Suffolk County are allowed to choose any two days off in lieu of celebrating Evacuation Day and Bunker Hill Day on the observance days. The two holidays are generally not observed by the private businesses. In Charlestown, where the Battle of Bunker Hill took place, there are week-long celebrations culminating in a road race and a parade. Some government services remain in operation, such as trash pickup in the City of Boston and all state Registry of Motor Vehicle offices. The MBTA runs a normal schedule but, due to special events, prohibits bicycles on the subway. ^ For example, the RMV offices are all open. ^ a b "With A Signature In Green, St. Patrick's Day Became A Holiday". March 12, 2010. Retrieved March 15, 2010. ^ Ryan, Andrew (March 17, 2009). "Happy Evacuation Day!". Boston Globe. Retrieved March 17, 2009. ^ Garrett Quinn (March 7, 2014). "Why are gays excluded from marching in the St. Patrick's Day Parade: A history of Boston's most important parade". The Republican. Retrieved March 10, 2014. ^ "Recycling and Trash Holiday Collection Schedule". ^ "Bikes on the T". July 2014. ^ "Beacon Hill Roll Call". Gatehouse Media. March 11, 2010. Retrieved March 15, 2010. ^ "Commonwealth of Massachusetts FY2011 Budget, Outside Section 5". July 14, 2010. Retrieved August 6, 2010. O'Connor, Thomas H. (1994). South Boston, My Home Town: The History of an Ethnic Neighborhood. UPNE. ISBN 978-1-55553-188-1. Vrabel, Jim (2004). When in Boston: a time line & almanac. UPNE. ISBN 978-1-55553-621-3. "Cambridge School Calendar 2007–2008" (PDF). Cambridge Public Schools. Archived from the original (PDF) on March 18, 2009. Retrieved March 17, 2009.